FeBREWary TGIF - Wag the Wolf - Final Friday! This February, in partnership with Beau’s All Natural Brewing, Kingston Yacht Club is proud to be offering five unique beers. A new beer will be released each Friday in February. 1 pitcher of draft and 2 nacho platters for $24.95! 2 pitchers and 1 nacho platter for $29.95! Congratulations to Peter Cohrs on winning the Blue Rodeo tickets in last week's FeBREWary draw! This is the final week of our FeBREWary promotion. We have had so much fun sampling tasty beers with you! Keep an eye on our taps for more in the future. Wag the Wolf is a weissbier (wheat beer) that has been generously “late-addition” hopped with organic New Zealand varieties to provide abundant aromas of citrus and tropical fruit. Made with 65% wheat, and fermented with a traditional German weissbier yeast, expect pleasant fruit and spice flavours with a restrained bitterness on the finish. For each FeBREWary beer that members purchase, they will receive a hand made wooden Beau’s coaster while supplies last. For information on all five offerings, click here. 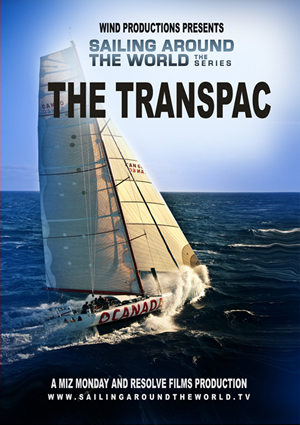 Able Sail Fundraiser - Premiere of "The Transpac"
Join us for a private screening of the sailing film The Transpac, silent auction and dessert tasting. The Open 60 sailboat O Canada and her all Canadian crew, led by world-renowned sailor Richard Clarke, reunite to race in the Transpacific sailing race from Long Beach, California to Honolulu, Hawaii. The Transpac covers approximately 2225 nautical miles and is famous for fast downwind sailing under spinnaker in the trade winds. With unprecedented coverage, you are taken on the adventure of a lifetime as every moment of their life onboard is caught on camera in this extremely intimate look at open ocean racing. The rain and freeze has made our ice surfaces perfect for a famliy skate or a game of pick-up hockey! We do our best to keep the surface clear but are always looking for help. There is a shovel in the main entrance of the club available to clear the surface. Thanks go out to those that have pitched in already! Remember: Members coming down to skate get 15% off their food purchase during restaurant hours! On Thursday February 27, starting at 7 pm downstairs, the Sailing Committee will be hosting the Sailors' Winter Meeting. This will be an informal meeting to discuss a variety of topics, including: the Sailing Calendar for 2014, suggestions for improving the Sailors' Handbook, scoring issues & options, matching boats needing crew with crew looking for boats and other ideas afoot. Please forward your thoughts for the meeting by email to Ken Martin at ken.martin@kingstonyachtclub.ca or in person to your fleet captain or any member of the Sailing Committee. The Sailors' Spring Meeting will be held upstairs on Tuesday April 15, starting at 7 pm. The Sailors' Handbook for 2014 will be presented and discussed at that time. Looking for an affordable way to advertise to Club members? We are currently accepting advertisers for our 2014 Sailors' Handbook. The deadline to submit ads is March 31. Anyone owning or working in a business/organisation that might be interested in advertising to KYC sailors should contact ken.martin@kinsgtonyachtclub.com for details. Yes! We are open for the Winter! Foodservice is offered at KYC from Thursday-Saturday! This menu is geared toward sharing, and warming up after winter activities. TGIF Friday: 2 Nachos 1 Pitcher / 1 Nacho 2 Pitchers see above! Robert topped the 50 boat international fleet from 10 countries for his first big international victory. Even though the score line was close, a very consistent 3,5,6,2,1,3 proved that he has made some strong gains this winter. Congratulations to KYC's Head Race Coach Rob Frost who has been selected as the 2013 "Coach of the Year". This is a great honour for Rob and KYC to get this national recognition. "Sail Trimming" on Thursday April 10th. Both talks start at 7PM. I would like to thank the members who attended the Town Hall meeting on January 22nd. The topic of discussion was primarily the long term financial plan for the club. The fact of the matter is the club does not currently have the financial capacity to fund the repair and remediation of our aging infrastructure. Some of this work needs to be done on the same timeline as the harbour project, and the rest as soon as possible thereafter, but likely ten or more years from now. I then presented how an increase in fees could put us on a solid track for being able to manage our operations and our long term infrastructure requirements. We will be issuing a survey shortly and are planning a follow-up Town Hall meeting to further discuss this approach. I want to be sure that all members, of all categories, are part of this discussion as this is an issue that affects everyone. We are really talking about the long term viability of the club, and all members should be very interested in this, but a fee change would also affect all members, and we want to know how you feel. We will be sending out a questionnaire shortly to help gather feedback, but we welcome all comments. Please send comments and questions to harbourquestions@kingstonyachtclub.ca. In keeping with our mandate to enhance sailing skills, Women in Wind, in collaboration with the Canada Power Squadron, is once again sponsoring two learning events for KYC members this Winter. SAIL: March 12, 26, April 2, 19, 23, 30, 2014 from 7:00 - 9:30 - Partridge Room. This Sailing Course is for new and experienced sailors who want to increase their sailing knowledge and skills. It covers the practical and theoretical basics of sailing and sailing seamanship. The range of topics is broad: from a description of different sailboat rigs, sail plans, hull types, and rigging to stability, balance, and the physics of sailing; from sailing at different points of sail to handling heavy weather and storm conditions; from spinnaker handling to reefing; from leaving the dock to mooring and anchoring. It also covers sailing safety, navigation rules, and sailing tactics. Cost: $150.00. Follow http://www.boatingcourses.ca/cities/Kingston to the Canada Power Squadron website to register for this course. Kingston Power and Sail Squadron has released new course dates for this year. Please visit their website for details. We also need volunteers for a Shark Regatta being held July 5th-6th. Currently need on shore volunteers and race committee. Please contact the office if you are interested. KYC's past (and present) iceboating history is prominently featured in this article (pages 8-13), which iceboating and non-iceboating enthusiasts alike will enjoy. Thanks to KYC's David Page and Ralph Shaw for their contribution to the article. We often forget that KYC was an Ice Yacht Club first! The Gas Dock is now closed for the Winter.